Over the years, people have expressed the desire to have a mentor, or coach, to see them through the transition from student to practitioner, or a forum where practitioners can gain more community and confidence. It can be daunting to go from school to practice, or feel isolated in a practice, either having had minimal clinical or herbal training and minimal practice with case studies, or simply little or no interaction with fellow practitioners to discuss cases. Our mentorship program was designed, and is being regularly adapted, to address these challenges. We have run this program since 2012. Our 2019 program is scheduled to begin on January 2, 2019. What will we learn in these groups? Your questions and case studies will steer the direction and content of the sessions. Who can join? Are there prerequisites? Graduated from an established program in Āyurveda that is at least one year in duration, or equivalent. Such a program should have covered (and you should be you comfortable with) Āyurvedic foundational principles including Ayurvedic anatomy & physiology (subdoṣas, dhātus, malas, upadhātus, srotāṃsi, agni, āma, etc.) the stages of Āyurvedic nutrition, saṃprāpti, etc. Have a working knowledge of Western anatomy & physiology (A&P). This can be achieved through Western A&P courses offered as part of a year-long Ayurveda program or through separate courses taken at a community college, university or some other comparable way. You don’t need to have mastered this information, but you need to be comfortable with the basics: the basic anatomy of cells, tissues, the skeleton, muscles and nervous tissue, what and where your organs and systems are, and their general functions. You should have clinical training and practice in your background and be: comfortable conducting an Ayurvedic assessment of a patient, developing a treatment plan and treating patients within your scope of practice. For example, the Ayurveda program you graduated from should have included training in differentiation of diseases, one-on-one supervision and training in applying theory to live patients, by working with patients and patient intake forms and practice with supervised case studies. You should be comfortable with S.O.A.P. note theory (that stands for “Subjective, Objective, Assessment and Plan” –it is a method of documentation employed by health care providers to write out notes in a patient’s chart–if you are not already familiar with each of those four terms in their medical context, please become so before applying to be part of the mentorship), filling out a rūgna patrakam [patient intake form, and Āyurvedic Assessment and Analysis], and in interacting with patients. Completed either a women’s health weekend workshop with Dr. Welch, her Healthier Hormones online class, or the online women’s health course we plan to host on this website starting Fall 2019, even if you are already a health care practitioner. Completely read Balance Your Hormones, Balance Your Life: Achieving Optimal Health and Wellness through Ayurveda, Chinese Medicine, and Western Science by Dr. Claudia Welch. 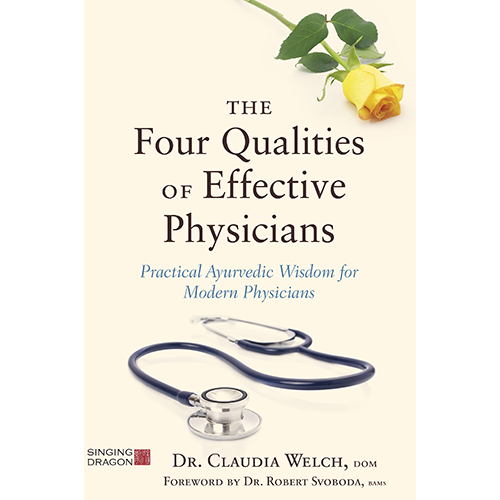 Completely read The Four Qualities of Effective Physicians: Practical Ayurvedic Wisdom for Modern Physicians by Dr. Claudia Welch. Completing these prerequisites before the first Mentorship session will ensure we all have the same basic language and concepts in our backgrounds and will allow us to move forward more smoothly into more specialized information. What is the format for the Mentorship Program? The program generally consists of an Orientation session, ten live 1 ½ hour audio sessions with Dr. Welch, where she will lecture on chosen topics and address selected questions and case studies presented by Mentorship participants. Pre-recorded lectures are also made available to students. We also generally have some supplemental study or discussion groups. The format for this might vary a little from one program to the next. What if I've taken a previous Mentorship Program with Dr. Welch, will this still benefit me? We offer a discount for returning students. If you still have questions, encounter challenging cases, want to know further what you know and what you don’t, or to go deeper in your understanding, or enjoy good company and discussions, you may find more benefit. Many participants, including seasoned Ayurvedic Practitioners, have taken the Mentorship Program multiple times. What is the cost? Refund Policy? If payment is received in full on or after 01 December, 2018, the cost is$1133 USD via credit card or PayPal, or $1100 by check. Early Bird discount: $1030 USD by credit card or PayPal account, or $1000 by check. Mentorship alumni discount: $773 USD by credit card or PayPal account, or $750 by check. No refunds after 11 January, 2019. What if I have to miss a session or cannot attend at the set day or time? We fully understand if a participant has to miss a scheduled session – or part of one. While there are no refunds for missed sessions, we intend to record the sessions so you can listen to them later, so you can make it up that way. We will work to make the recordings available within a couple days of the live sessions. What technological expertise and equipment do I need to be able to participate in the mentorship? You only need a way to call in to a conference number. A landline is often best, but cell phones, Skype, Google Voice, etc. can also work. Once you register, you’ll be given specific instructions. To access recorded sessions, you will need a computer with internet access. In the mentorships, Dr. Welch often makes previous relevant lectures available, at no extra cost, to current students, so they may access that information without taking up extra live time during current sessions. This adds extra lectures and value at no extra cost to you. You will have access to this information, along with your lectures and study sessions, until 5 months after the completion of your last class. Dr. Welch’s lectures and case studies covered in these mentorship sessions will also be edited and added to the libraries for future use. When Do We Start & What’s the Schedule? Our 2019 program has already started. Our next program is not likely to be until 2021. We plan to let you know the schedule for that program here, about five months prior to it, through our newsletter. You can sign up for that on almost any page of this website. After ensuring you’ve met all the program prerequisites, kindly contact us to let us know your interest at office@DrClaudiaWelch.com. We will plan to send you a registration form for the next mentorship program, several months before the program starts. It’s a shame that the mentorship is coming to an end. I really enjoyed it and learned a huge amount, I never expected to get so much out of it. A big thank you for everybody’s input. R.
Being mentored by Claudia in a small group setting was nothing short of magical. Our time was spent diving deep into the well of Ayurveda, exploring concepts and teachings that are at the root of our practice. It was so lovely to share this time with each of the participants as well; we may have been far apart in the physical sense but near in the ways of the heart. A beautiful way to learn and grow. – L.J. Being a part of Dr Welch’s Mentorship Group has been such a rich experience for me. The depth of wisdom that Dr Welch generously shares is invaluable to any Ayurvedic practitioner. If you have been thinking about joining….no need to hesitate! It is a wonderful course. With gratitude, J. If you are ready to take your studies to the next level, I strongly recommend Dr. Claudia’s Mentorship program. She is a brilliant teacher/student of Ayurveda and is somehow able to share this gift with us while at the same time being fully present and humble. I feel blessed that Dhanvantari allows our paths to cross again and again and that I am able to share this knowledge with my clients. If you can join a mentorship group just do it. I don’t know any other place for me where I can have the ear of such a gifted teacher in my continuing studies at home. – T.R. What a wonderful opportunity… Dr. Claudia has the unique ability to help students at any level hone their understanding of Ayurveda and medicine. She is learned and skillful in the art of finding the right approach for each client and situation–I’ve learned so much from her and am so grateful. – K. G.
If you’re reading this statement, that means you’ve somehow come to learn about Dr. Claudia Welch. Congratulations for that. Knowing that I’ll probably never get a chance to support your life in any way other than writing this sentence: my hope is that you will consider reading her book, taking her online courses, attending a seminar, or any and all of the above. Good luck. – J. P.
I’ve done other online things before. I find the format and approach you’ve chosen works really well for me. I appreciate the …layout of the program, I like the forum, I like that I can listen to recordings over and over… I can’t think of anything that would improve things. As far as I’m concerned – you rocked the casbah on this. Thank you so much for the amazing opportunity to be in the mentorship program. It has been a wonderful opportunity for me to broaden and deepen my understanding, as well as develop more flexibility in my way of thinking about things from the Ayurvedic view. I appreciate that it re-enforced something I already know – that the Vedic sciences are very subtle and powerful medicine. I also loved learning more and more how to become medicinal in my thoughts, words and deeds – in my heart. I love you Dr. Claudia. Thank you from the depths of my being. I look forward to another mentorship program… God willing ❤ (representing Canada in the 2016 program)–M.W. I wanted to let you both know how much I enjoyed and appreciated the mentorship program this winter. It was one of the highlights of the season, for sure. I miss it already and look forward to the next round. I am enjoying re-listening to some of the lectures and getting even more out of it. Thank you for keeping those available for awhile. Truly, it was a great experience and a brilliant offering.